When the inspiration first came to me, to try my hand at writing fantasy outside of the usual medieval European framework, I knew exactly where I wanted to begin. I hadn’t read Charles Saunders. I thought for certain I was doing something new–a speculative fiction Jackie Robinson. I’d read enough fantasy to know the basics. I had to create a world, a setting distinct from the Eurocentric fantasy I’d grown up with. I chose Africa with hardly a second thought. Most fantasy works by white authors were set in some version of medieval Europe. Black people were from Africa–that’s what I was going with. Besides, I was no slouch on Africa. My parents had filled our house with books on African culture, art and history. I was taken to see African theater. I’d visited Africa at least once. Being a political junkie, I even felt it my responsibility to read African newspapers to keep up with what was going on. Heck, I listened to Fela! Sure, as the child of Caribbean immigrants, I was more than a few generations removed; but in my mind Africa was something always near–in my music, in celebrations like Carnival, in my fashion, my thoughts. So when I began creating worlds out of varied kingdoms, and scoured through the folklore and myths of diverse African cultures for magic systems, gods and monsters, I never thought of it as “appropriation.” Africa was mine. Wasn’t it? A recent roundtable at the World SF blog focusing on non-Western cultures in speculative fiction asked the following question: What are the problematics of some Western writers tackling non-Western settings for their novels, and do they result in exoticism? I’ve read enough Edward Said, Paul Gikandi and Uday Singh Mehta to shout my AMENS! to this sentiment. No one has to convince me on the realities of colonialism, and the ways in which it has historically created hierarchies of difference as part of the process of imperialism and subjugation. I had come out of a postcolonial experience. And as a POC in the United States, I knew all too well about marginalization and silenced voices. For the most part, however, I tended to place myself outside of the Western gaze; that was something for white people to get hipped to by reading E. Ann Kaplan and listening to Tim Wise. Yet as I thought on it further, I was no more inoculated against this gaze than any other Westerner. I grew up with all those “fixed” notions of the East–as exotic, mysterious, where I expected most people knew some form of martial arts. That’s what I saw in the movies and television (see Jeff Adachi’s Slanted Screen for a quick primer). I had to be educated out of those thoughts. Being a POC, without the privilege of whiteness, perhaps allowed me to understand these stereotypes as essentialist and reductionist once I saw them for what they were; but it didn’t stop me from being affected by them. To this day, even knowing better, it’s not abnormal for thoughts of katana wielding samurai out of some film to spontaneously enter my head when I think of feudal Japan. It’s hard to unlearn what you’ve long been taught. Sadly, neither was there any magic armor that insulated me from the Western gaze of Africa. I grew up with all of the stereotypes of the “dark continent,” from media to textbooks. Africa as “savage” as “backwards” as a strange place of maladies and woe, permeated my childhood. Popular media, literature and even public school only served to reinforce these negative depictions. I was, however, offered counter-narratives. These came primarily from my parents and the larger black diaspora community–part of a tradition of re-imagining and re-translating white Western depictions of the continent (discussed in part I of this topic). Some of these perspectives challenged or sought to negate stereotypes of Africa, most, admittedly, through romanticism; others found ways to subvert stereotypes into something positive, or at least something momentarily advantageous. My 11th grade chemistry teacher, Mr. Murphy, probably shocked my mostly white classmates by declaring in an irate voice, “‘Ya’ll better not mess with me! My ancestors are from Africa! I know how to chunk a spear!” One’s ancestral validations can take strange turns. I don’t think it’s possible for white westerners to write about any non-dominant cultures–and this includes, for example, Eastern Europe–without being exotifying, appropriative, and perpetuating western/first-world supremacy…. Specifically that an outsider looking in will seize on elements an insider takes for granted. Something that’s everyday to me will be shiny, exotic, and unusual to a westerner: and it is this thing that they will grab and run away with, hooting that it’s beautiful and awesome and so weird, as one might do over an alien artifact. And that’s what it will be to such a person–alien. I’ve seen this over and over even from writers who mean well . . . but who nevertheless continue to write and think in the western outsider mode, in short owing their allegiance to their culture, readers who think and consume and behave as they do. More claps from the amen chorus, and more introspection. Though requireshate specifically mentions white Westerners, I put the question to myself. In my use of African history and culture to shape worlds of fantasy, am I “appropriating?” True enough, I’m not asking anyone’s permission. And I quite freely change/alter cultures to fit my purposes and the art of storytelling. When writing African fantasy, you can spend hours researching some word or weapon or some other trait that you quite proudly relate in great detail, highlighting it for the sake of its difference. It can have the effect of coming off like some 19th century British explorer on safari–or worse yet, an anthropologist. Yet again, matters here are more complicated. Requireshate’s use of the modifier “dominant” is especially relevant. Cultural appropriation as it is defined exists in a context of colonialism, slavery and exploitation by “dominant” forces. As marginalized and oppressed groups who are themselves the outcome of colonialism and slavery, people of African descent can hardly be seen as “appropriating” what was once theirs. Black African fantasy writers are a distinct minority in a genre dominated by Eurocentric themes. And there is often a desire, sometimes to the point of becoming obsessive, to stress the difference and cultural relevancy of your work. I never want any reader to mistake my African-influenced setting with a European one; my protagonists and characters aren’t merely white people in blackface. My settings should not evoke thoughts of Westeros or the Shire; Elves and broadswords will not be making an appearance. 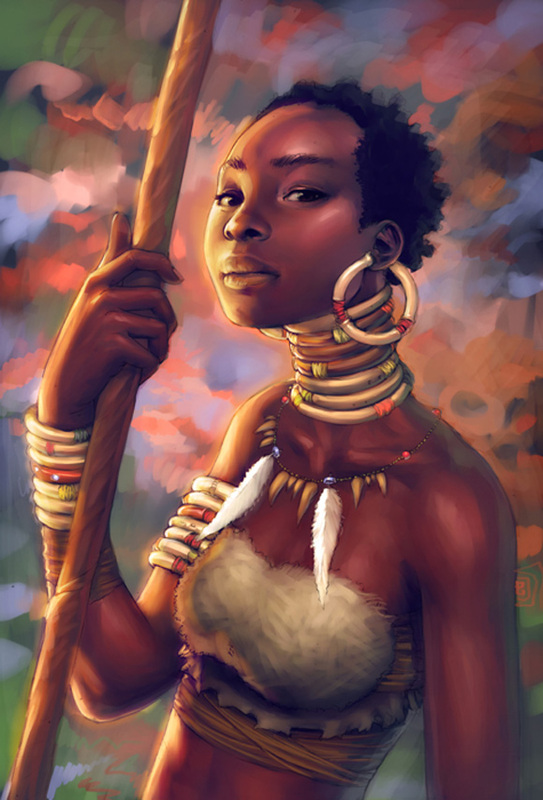 Hang around any brainstormers in this sub-genre and you’ll see endless suggestions of books on various types of precolonial African dress, governmental structures, kingship, familial patterns, customs, etc. I know one fellow writer who spends a great deal of time studying and collecting African knives and swords. This need to illustrate distinction runs a clear danger of crossing the line into exoticism, but a great deal of thought goes into it. Writers may feel the need to describe an African village or market with the details of a tourist guidebook–if only because he expects his Western audience is not only wholly unfamiliar with such a setting, but indoctrinated to expect a European setting unless clearly told otherwise. A fellow writer once remarked to me that unless she markedly shows her characters aren’t white, readers (both whites and POC) tend to assume they are: the privileges of whiteness. None of this excuses exoticism of course, by anyone. And any writer, should remain mindful that he/she is writing about people and cultures with complexities and depth–not fixed, static objects. But the term “appropriation” is inherently one about power of “dominant” groupings, and this seems *inappropriate* to describe the cultural adaptations of Africa into their works. It should also be pointed out, for many black writers of fantasy these re-imagined versions of Africa are not something alien, definitively set apart. Rather they are often seen as extensions of black identity, an ancestral home, one half of that Du Boisian double-consciousness discussed in the previous post. For some, these stories function as a means to negate many of the disparaging depictions of Africa and to highlight African culture, folklore and history. This may be one of the key differences in Sword and Soul, that sets it apart from dominant Eurocentric fantasy. There’s an underlying tone of activism in the writing, whether by intent or circumstance, with the aim of both bringing Africa into the larger fantasy genre, and displaying to new readers the continent’s rich cultural, political and social history–on par with anything found in medieval Europe. This all leads to a troublesome word–authenticity. Within The World SF Blog panel discussion, the issue of an “authentic” narrative of the non-Western world comes up often. I once got a comment from someone who’d read one of my stories, hailing its “cultural authenticity.” I immediately winced. Unless someone has a functioning TARDIS (and if you do, we need to talk), I am no more going to authentically recreate life in the medieval Sahel than Tolkien’s Middle Earth could authentically recreate medieval western Europe. I don’t care how many books you read. Fantasy is an inherently inauthentic genre–that’s why it’s called “fantasy.” To put it bluntly–we make sh*t up. It’s usually based on some past that-never-was, piece-mealed from old cultures and stitched together with a great deal of imagination. My stories are influenced by Africa; they draw on Africa; they are however, not Africa. I embellish elements of African folklore, and myth, much as Tolkien embellished Germanic folklore to create his version of dwarves and elves. I mix, I mash, I create. To seek the “authenticity” in African fantasy is to assume that writers simply copied verbatim what they found in a book on folklore. That would be boring. And not very creative. Like a good DJ, writers of African fantasy practice the fine art of sampling, stringing together beats to create an original track.This can lend itself to legitimate criticisms of appropriation, especially in the ways in which writers adapt cultures, folklore and customs to fit their needs. It’s a worthy discussion to have, but there are perhaps alternative words (beyond appropriation) to define it. This hybridity may allow for a more nuanced perspective on the adaptation of African cultures by diaspora writers. As illustrated by Saunders gumbo hypothesis, Sword and Soul creates something new by blending various African elements from multiple cultures with the Western genre of modern fantasy. What is created in the end is neither distinctly Africa nor Western–but something new. In Avatar, a diversity of traditional Asian cultures are similarly pulled upon, to create a new fantasy world. This cultural synthesis is easily found in the African diaspora, as religions like Vodun, Santeria or Candomble can attest. Jha goes further to quote Vijay Prashad’s Everybody Was Kung Fu Fighting: Afro-Asian Connections and the Myth of Cultural Purity to discuss what she terms the “porousness” and “fluidity” of culture, imagining not the multicultural but the polycultural, where encounters are “not between two or more static entities, but between multiple entities that are already influenced by each other in some form and must constantly re-negotiate with each other.” It is a reminder of several things: (1) the false narrative of “purity” in African culture, assumes (quite wrongly) that the continent was indeed “dark”, when in fact it was in continuous contact with the Asian and Mediterranean world, where this “pourousness” and “fluidity” of culture flowed in either direction; (2) thus African culture is not static, rigid and unchanging, but as adaptable as any other culture to fantasy. (3) Cultural transfer goes both ways. Much of modern day African music (Afrobeat), dress, dance, culture has flowed back from the Diaspora (the U.S., the Caribbean, Brazil) to the continent. So there is a bi-directional sense of cultural exchange. There is however a glaring problem within modern African fantasy, one that can’t be rationalized or explored with theoretical frameworks. And that is the obvious lack of presence, or voice, of African writers in the sub-genre. Sword and Soul, at least that which is most accessible to the reading public, remains mostly the product of writers several generations removed from Africa. Even marginalized, this Western voice is inherently privileged and speaks from a distinct lens that may function to silence non-Western voices. A friend remarked to me that more than a few of my fantasy stories bring up themes of slavery. Not surprising–it’s both my academic focus and part of that “psychic terror” that writers like Paul Gilroy theorize lies within much of the descendants of the Middle Passage. Yet I can imagine that for some African writers of fantasy, for whom the trans-Atlantic trade was not a focal point of their historical experience, other issues may be given privilege which speak to their own histories and experiences. I am not stating that an African voice would immediately lend “credibility” or create that elusive “authenticity” to African fantasy. A person from modern SE Nigeria would still suffer from temporal displacement from his/her subject matter (see my bit above about the need for a functioning TARDIS) inherent to modern fantasy’s usual focus on a mythic/folkloric past. Neither should it be assumed that someone from SE Nigeria could immediately give voice to Northern Nigeria, or the Congo or Somalia for that matter. Rather, I do believe multiple African voices can undoubtedly bring a great deal to the sub-genre, so we are no longer speaking of privileges and silences, but an engaging dialogue. *This notion of lacking voices can be expanded to include the need for more black women’s voices, black LGBT voices and other doubly marginalized groups, but that’s a whole notha’ blog. While I think it’s important not to generalize this sentiment as speaking for all Africans, and Chikere’s statement is about science fiction and the medium of film, there are lessons here for fantasy. As a Western writer of African descent, there is little doubt that my concerns, the things upon which I place importance, my value system, my ideas of what is “right” and “wrong” are shaped heavily by my Western reality, albeit a marginalized one. …people from a different culture are going to have vastly different values and assumptions, and you just can’t transplant, say, a modern British person and pass them off as a Vietnamese just through a little change of costumes! You have to understand what makes a culture’s bedrock, what is likely to make people tick, what they’re likely to value and hate–different cultures have radically different axes. In the criteria, they wrote that they sought “novels of freshness and originality that represent the finest examples of contemporary fiction out of Africa.” Then on the same page, they wrote: “Submissions in the children’s literature, science fiction or fantasy genres will not be considered.” . . . “no fantasy or science fiction” . . . ? For a prize in AFRICAN literature? . . . . Imagine how many potential African science fiction or fantasy writers and novels have been effectively excluded, disqualified, and demoralized by this mere stipulation. Numerous African writers, like Binyavanga Wainaina and Chimamanda Adichie, while not addressing speculative fiction directly, have discussed this narrow definition of what is considered to be marketable African literature by the West–both in how Africa is to be depicted, and what African writers are expected to write about. There is an interesting convergence here with black Western writers of African fantasy, who suffer from issues of marginalization by the mainstream publishing world (and even from the larger fantasy community) that often involve expectations of what black speculative fiction should be and a reluctance to tell fantasy stories beyond the Eurocentric norm. All of this however, is not to say that there are no existing African voices in modern fantasy, among authors both currently located in Africa proper and those of the more recent diaspora to the West. Though billed more as a fairy-tale, award-winning novelst Ben Okri’s Starbook pulls on traditional African culture. Okri’s work is not marketed as genre fiction, and with good reason; his dream-like tale is more allegory than heroic fantasy. Though there are parallels in the form of world-building and the use of magic, it is distinctly different from modern fantasy. In a great deal of modern African literature in fact, there is often the use or recitation of traditional African folklore–as in the works of Nigerian author Chinua Achebe. However, again, this is usually for the purpose of expressing some larger real-world issue, and not modern fantasy in of itself. To find African writers in the sub-genre, you have to look to more independent efforts. Born in Nigeria and raised in Cameroon, African fantasy writer Anthony Kwamu is author of Timbuktu Chronicles: Aida and the Chosen Soldier, and recently contributed the story The General’s Daughter to the Sword and Soul anthology, Griots. Indie Nigerian author Ifedayo Adigwe Akintomide draws on traditional Africa to tell his tale of the sword-and-spear wielding Konga, who battles monsters, magic and gods in kingdoms like Ile-Ife. The blog Indi-gene-ous, started in 2011, features fantasy stories written by Nigerian author Gene O. The blog’s stated purpose is “to create and promote African fantasy . . . though most of the tales . . . may not be set in actual African locations or be about actual traditions, all the characters, environments, stories and ideas are drawn from the rich historical diverse cultures of the great continent of Africa.” Most probably, there are a wide number of fledgling African writers of fantasy, or those who flirt with the idea. Some of these may be from Africa proper; many others will be found in the more modern diaspora, and their fantasy will likely reflect the new duality of being African and Western. All of these coming voices will be a much welcome addition. But this piece is focused primarily on the Western writer, and his/her attempts to depict Africa in fantasy. Some level of mistranslation, “appropriation” and exoticism seems inevitable, given our immersion in the West. Still, that doesn’t mean a writer has to surrender his/her ability to be conscious of these dangers. In the final installment, I’ll touch on some suggestions on how writers in the West (particularly black writers) can engage in African fantasy and try to avoid some of these pitfalls. This entry was posted in Intellektshul, Personal Musings and tagged Africa, African Fantasy, African literature, African writers, Airbender, Exoticism, fantasy, hybridity, identity, Jaymee Gho, Magic, non-Westerm, Peter X Feng, Race, Speculative Fiction, Sword and Soul, Vijay Prashad, World SF Blog by The Disgruntled Haradrim. Bookmark the permalink. GAAAAHH! the great ronald jones has graced my blog! my brain is set to explode! GAAAAAHHH! Excellent as always. I have been curious about Africans writing fantasy fiction. But I believe I can say they are out there. The story The Generals’ Daughter in Griots was written by Athony Kwamu, a young brother born in Nigeria and raised in Cameroon. I came across Anthony after seeing his fantasy book, the Timbuktu Chronicles, on the shelf at a local Barnes and Noble. We also received a number of submissions from Kenyan writers. And then there are my many young Nigerian artist friends creating fantasy images derived directly from their culture. I believe the situation is just like you and I writing our own versions of African based fantasy while never knowing about Charles R. Saunders. The African fantasy writers are there. We just haven’t discovered them yet. Even marginalized, this Western voice is inherently privileged and speaks from a distinct lens that may function to silence non-Western voices. I’m pleased that you mentioned Ben Okri’s Starbook, before I happened upon that paragraph I was thinking about how a lot of African books that could be termed “speculative fiction” are marketed as “magic realism”. agreed. i think it’s hard for those who may be denied power in one dynamic, to see that they may be granted privilege in others. regarding african writers…many popular african authors do use folklore (i.e., chinua achebe) but don’t go as far as developing full-fledged fantasy novels. even ben okri’s starbook is more fairytale than fantasy (though as u point out, it could still at least be marketed as speculative fiction–interesting that it’s not). then there’s amos tutuola’s classic “palm wine drinkard” (one of the wildest reads ever!) which also fits magical realism and speculative fiction, but ends up in the african literature section. the idea by marketers is that those interested in african writers will be reading these books–not speculative fiction fans. placing them in both might make most sense, but many bookstores treat this as sacrilege. I think it struck me a few years ago how many fantasy like, or just plain weird books by African authors exist out there. You’re right in that they are not full-fledged fantasy…I wonder what it’ll take for magical realism to be lumped under the speculative fiction genre. Sometimes I feel with genre labelling, perhaps Western bookstores don’t know where to place a book that otherwise takes place in a modern African city but talks about sighting and hunting mermaids or being transported to an alternate plane while spinning around a house. It is easier to place such books in the African literature section. A very enlightening article . And an honour to be mentioned.To the prosperity of true African Fantasy! Cheers! Gene. Thanks for the read. Hope to read more of your work in the future! NIIIICCE!!! Would you consider the translations of oral epics as historical fantasy? They do have both the aspects of sorcery/magic interwoven with historical events. Like Gassire’s Lute, which I have along side Beowulf. What’s up, this weekend is good for me, for the reason that this moment i am reading this great educational paragraph here at my house.